Sensotronic Brake Control (SBC) works electronically and thus faster and more precise, than a conventional hydraulic braking system. As soon as the brake pedal is pressed, the sensor identifies the driving situation in hand; the system makes an exact calculation of the brake force necessary and distributes it between the wheels as required. This allows SBC to critically reduce stopping distances. SBC also helps to optimize safety functions such as ESP, ASR, ABS and BAS. When the brake pedal is pressed, the brake booster connected to it amplifies the pressure on the pedal. This pressure moves the piston on the master cylinder forcing the brake fluid through the tubing and flexible hose to the wheel cylinders. The output piston pushes the brake shoe against the wall of the brake drum, thus retarding the rotation of the wheel. When pressure on the pedal is released, the springs on the brake shoe return the wheel cylinder piston to their released position. This action forces the displaced brake fluid back through the flexible hose and tubing to the master cylinder. 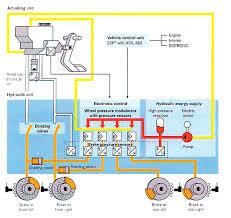 The force applied to the brake pedal produces a proportional force on each of the output pistons, which in turn apply the brake shoes frictionally to the turning wheels to retard rotation. In Sensotronic Brake Control a large number of mechanical components are simply replaced by electronic components. SBC mainly have three parts – an actuator unit, electronic control unit, hydraulic power supply and hydraulic unit.